You'll be £19.99 closer to your next £10.00 credit when you purchase A Paradise of Blood. What's this? In 1811, a portion of the Creek Indians who inhabited a vast area across the American Southeast interpreted a tremor as an omen that they had to return to their traditional way of life. What was an internal Indian dispute soon became engulfed in the War of 1812. At immediate stake was whether the Creeks and their British and Spanish allies or the young United States would control millions of acres of highly fertile land. The conflicts larger issue was whether the Creek, Cherokee, Choctaw, and Chickasaw would be able to remain in their ancestral homes. Beginning with conquistador Ferdinand DeSotos fateful encounter with Indians of the southeast in the 1500s, A Paradise of Blood: The Creek War of 181314 by Howard T. Weir, III, narrates the complete story of the cultural clash for this landscape of stunning beauty. Using contemporary letters, military reports, and other primary sources, the author places the Creek War in the context of Tecumsehs fight for Native American independence and the ongoing war between the United States and European powers for control of North America. The Creek War was marked by savagery, such as the murder of hundreds of settlers at Fort Mims, Alabama, and fierce battles, including Horseshoe Bend, that marked the end to the war. Many notable personalities fought during the conflict, including Andrew Jackson, Sam Houston, William Weatherford, and Davy Crockett. When the war was over, more than twenty million acres had been added to the United States, thousands of Indians were dead or homeless, and Jackson was on his way to the presidency. The war eliminated the last effective Native American resistance to westward expansion east of the Mississippi, and by giving the United States land that was ideal for large-scale cotton planting, it laid the foundation for the Civil War a generation later. 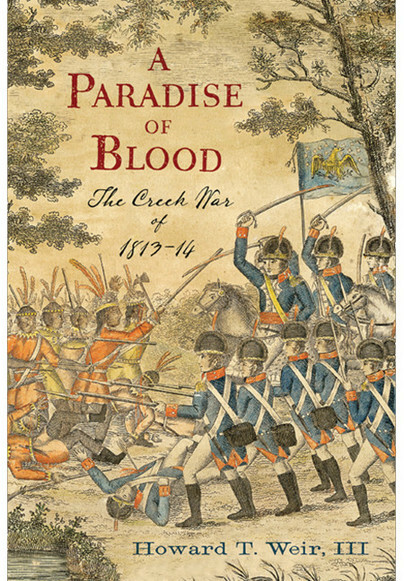 A Paradise of Blood is a comprehensive and masterful history of one of Americas most important and influential early wars. Having written a book on the topic ourselves, we consider ourselves knowledgeable on the subject and stay on the lookout for new works in the field. So when we saw Howard T. Weir’s new book A Paradise of Blood, The Creek War of 1813-14, we bought it and delved into this latest chronicle of this incredible chapter in American history. We believe Weir has written the definitive account of the conflict and become the true expert in the field. This book is an epic. The figures who mattered in the Creek Indian War -- Tecumseh, Andrew Jackson, Sam Houston, and and a large cast of prophets, war chiefs, schemers, traders, and speculators -- are American archetypes. They were all trying to stake a claim to a huge prize, the fertile lands of the Deep South. Howard Weir has done prodigious research, and his command of the detail of the period results in a you-are-right-there experience for the reader. Better still, he understands and portrays the major characters in their full, complicated humanity. The Alabama territory was remote, but there are world-class scoundrels, heroes, and warriors in this book. Maybe the most admirable of them all was the War Chief William Weatherford, who rode his gray stallion off a high bluff and into the Alabama River to escape the forces of Andrew Jackson. For most Americans, the Creek Indian War is at best a footnote to the War of 1812. In A Paradise of Blood, Weir has shown that the war was something greater than that, a contest to determine the fate of nations -- the Creek nation and the new American nation. This book glows with Weir's love of his subject and his evocation of the place. The man can write. HOWARD T. WEIR, III has a BA in history from the University ofCalifornia at Berkeley, an MFA from Hollins University, and a JD from the University of Alabama School of Law. He studied creative writing under James Dickey, George Garrett, and Lillian Hellman.